Storm erupts once again in Turkey over anti-Semitic comments made by another high-profile official in 'revenge' for Temple Mount clashes. 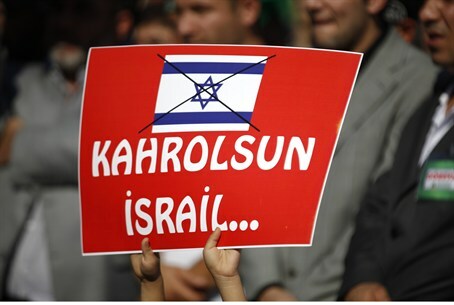 A political storm has erupted in Turkey over yet another anti-Semitic comment issued by a high-profile politician. On Friday, the governor of the city of Edirne announced that a synagogue being renovated in the city would be turned into a museum in revenge for Israel's actions during Arab riots at the Al Aqsa Mosque on Jerusalem's Temple Mount. Earlier this month, police stormed the mosque to tackle Islamist rioters who had barricaded themselves inside the building and were launching fireworks and other projectiles at them. "When those bandits blow winds of war inside al-Aqsa and slain Muslims, we build their synagogues," fired Dursun Şahin according to Hurriyet Daily News, referring to the renovations currently being carried out at the Büyük Synagogue (the Great Synagogue) at a cost of 3.7 million Turkish Liras. The synagogue was built in 1907 and is located in the village of Kaleiçi. "I say this with a huge hatred inside me," Şahin continued. "We clean their graveyards, send their projects to boards. The synagogue here will be registered only as a museum, and there will be no exhibition inside it." In reaction to the comments, a leading member of Turkey's opposition called on the governor to resign. "If Şahin will not resign to save the dignity of his post and Turkey’s honor, he should be removed from his post immediately," said Republican People’s Party (CHP) MP Aykan Erdemir, who lamented the fact that "hatred and anti-Semitism grabbed the state." Turkey has indeed seen a rise in anti-Semitic hate crimes since the rise of President Recep Tayyip Erdogan's Islamist AKP party. Although violent attacks are still relatively rare, anti-Jewish incitement has become commonplace. Just over a week ago it was revealed that US officials had expressed deep concern over the rising levels of anti-Semitism in Turkey, and a report late last year revealed that young Turkish Jews were leaving the country in droves as a result. Responding to the controversy, a top Turkish official clarified that Şahin did not have a say in the renovation project, and that the synagogue would continue to serve both as a place of worship and a site for tourists and others to visit, as it was before. "All decision regarding the functions of the buildings owned by the Directorate General of Foundations is taken by the directorate," Foundations Director General Adnan Ertem clarified to Anadolu Agency Saturday. "Our intentions is to keep that building as a house of worship to serve all visitors."